More than 2,000 attendees flocked to the ritzy MGM Grand Hotel & Casino in Las Vegas on July 6-8 for the 2017 Martial Arts SuperShow. This year marked the 16th annual of this extravaganza, the world’s largest martial arts business convention and tradeshow. Like its predecessors, MASS17 offered big educational benefits to everyone who attended, regardless of their martial art and style or the size of their school. Century, the world’s biggest martial arts equipment supplier, and its subsidiary, the Martial Arts Industry Association (MAIA), co-produce this three-day extravaganza each year. The event started with opening ceremonies where the MGM Grand’s elegant Ka Theatre went completely dark and dancers in electronic, glow-in-the-dark suits came to life accompanied by loud cheers from the audience. The dancers put on an incredible show for the audience. After that acrobats took the stage, followed by a demo from Team Paul Mitchell Karate and Benny “The Jet” Urquidez was presented with the MAIA Lifetime Achievement Award. 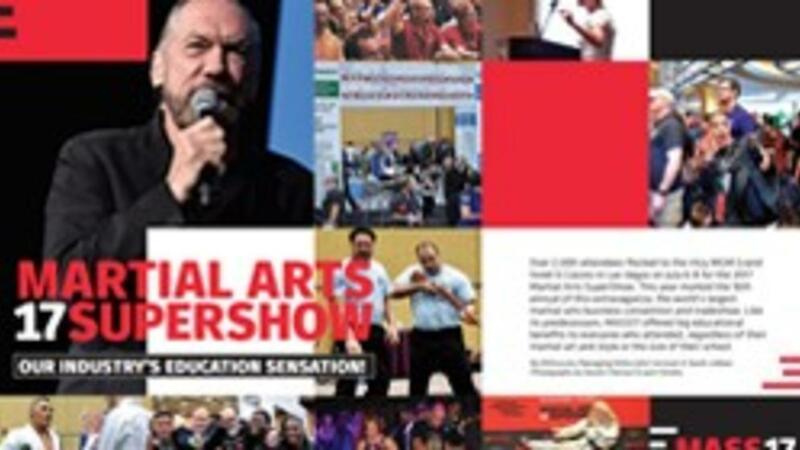 This year’s keynote speaker was John Paul DeJoria, co-founder and Chairman of John Paul Mitchell Systems, who, for the past 30 years, has sponsored Team Paul Mitchell Karate. DeJoria’s remarkable poverty-to-penthouse story exemplifies the American Dream. Twice homeless and living in his car, he become a billionaire and renowned philanthropist through his hard work and perseverance. After the Opening Ceremonies came to a close, attendees went out to hit the town or go back to their rooms to get some rest and prepare for the exciting day of seminars ahead of them! The next day the Education Sensation started. The tradeshow floor was set up with more than 80 vendors, seminars were held throughout the day and rooms with mats were set up for physical-training sessions. The educational seminars covered a wide range of topics, from how to hold the perfect summer camp to achieving social-media success. Several popular seminar’s included Barry Van Over’s 10 Must-Dos of Owning a Martial Arts School, Rondy McKee’s Low-Cost, No-Cost, Income-Generating Recruitment, and Mike Metzger’s Generating More Revenue with Every Enrollment. The physical training seminars drew in many martial artists, eager to train with the best-of-the-best. Instructors included Master Rickson Gracie, who had been promoted to red belt only a day before his seminar during one of the show’s pre-con events. Benny “The Jet” Urquidez also led a training session focused on the Ukidokan karate system he created. Four Olympians — Marti Malloy and Mike Swain representing judo, and Juan Moreno and Herb Perez representing taekwondo — also led seminars.